In late August 2012, just weeks after the spectacular landing of the Curiosity rover on Mars, NASA capitalized on success and announced InSight as its next mission to the Red Planet. NASA Administrator Charlie Bolden made the connection explicit: "The recent successful landing of the Curiosity rover has galvanized public interest in space exploration and today's announcement makes clear there are more exciting Mars missions to come." 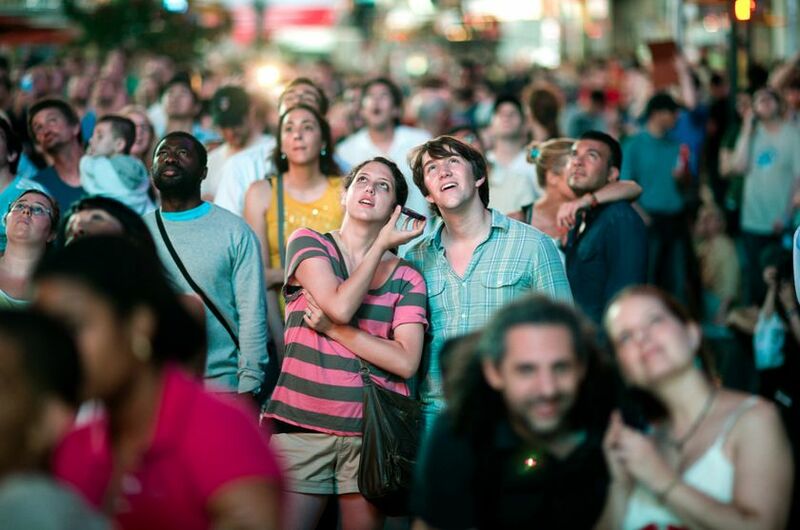 A couple in Times Square listens intently to the news reports as NASA's Curiosity rover attempts to land on Mars. Later that year, the Curiosity team shared their initial, exciting science results at the December meeting of the American Geophysical Union. 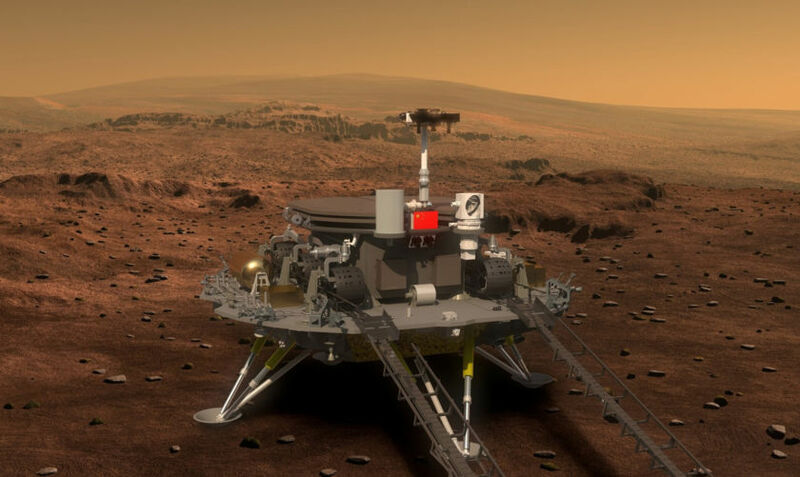 At the same meeting, the associate administrator for NASA's Science Mission Directorate John Grunsfeld used the opportunity to announce Mars 2020, a flagship-class rover that would take the first step in returning samples from Mars to Earth. That announcement, in 2012, was the last time NASA committed to a new Mars mission. InSight's landing provides a rare opportunity for NASA: a Mars success has briefly captured popular and political attention. Stunning pictures of a new Martian landscape have made it to the pages of major news outlets. Millions of people watched its landing around the world. And in perhaps their first time agreeing on anything, President Trump and the New York Times Editorial Board both sang InSight's praises. As the President's budget proposal for fiscal year 2020 is being finalized, now is the time for NASA to secure a new commitment for the next step at the Red Planet: Mars sample return. Recall that InSight is a "small" planetary mission compared to the technical and scientific challenges of Mars Sample Return. No other nation has yet achieved a successful landing on Mars, much less attempted to return samples. A clear political commitment now would send an unmistakable signal that the United States intends to continue its leadership at Mars. More than 3.6 million people watched the landing on JPL's YouTube stream alone, with millions more following around the world, including the Vice President. President Trump highlighted the landing at a rally later that night. The New York Times used the opportunity to make the case for planetary exploration in its Editorial section. The current National Academies decadal survey report on planetary science—the gold standard for scientific consensus in space sciences—declared that: "the highest priority missions for Mars in the coming decade are the elements of the Mars sample return campaign." It recommended that NASA pursue the first step of such a campaign as the highest priority flagship mission in this decade. Mars 2020 is that first step. The rover will launch in 2020 and will begin collecting samples for Earth return in 2021. Now that the first step is happening, the second must be taken. 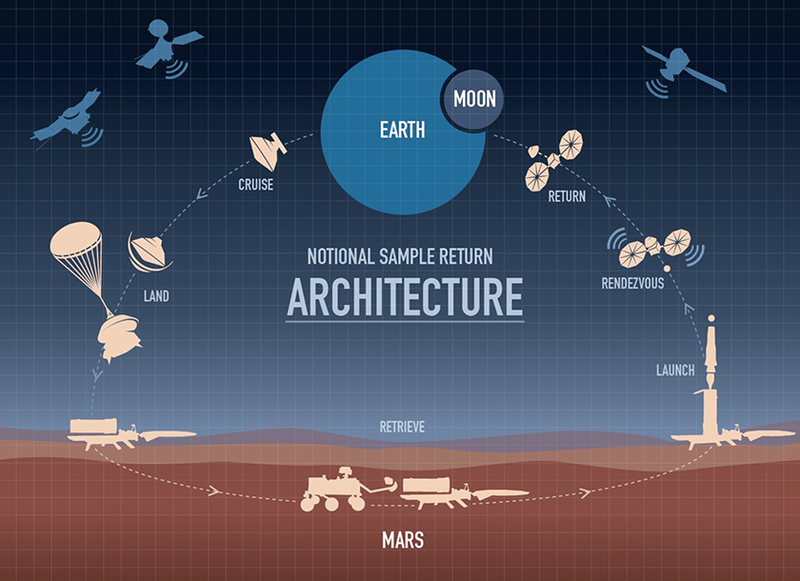 A high-level overview of NASA's latest proposed Mars sample return mission. NASA's Associate Administrator of Science Thomas Zurbuchen announced the study of a "lean sample return" effort for Mars in August 2017, which will look to engage commercial and international partners, thereby lowering the overall cost of sample return. He also proposed to move fast, with a launch goal of 2026. Unfortunately, NASA' fiscal year 2019 budget proposal did not contain the coveted "new start" commitment for such a mission, but it did request $50 million in funds to study the concept. In the meantime, technology development has progressed on critical elements of Mars sample return architecture, including a Mars ascent vehicle rocket necessary to launch samples into orbit. The European Space Agency is actively studying how it could participate in such a campaign. The pieces are there, waiting to be assembled into a full mission. With the exception of InSight, NASA's other Mars orbiters and rovers have exceeded their warranty periods. The critical satellite communications infrastructure NASA worked so hard to place at Mars in the 2000s has nothing planned to replace it. Absent this infrastructure, operating Mars sample return and other ground missions becomes much more difficult. Committing to a sample return mission now would give it a fighting chance to utilize the existing infrastructure in the mid-2020s. International interest in Mars will be reaching new peaks in the next decade, with new missions planned by the UAE, China, Japan, and the European Space Agency. NASA should not back down on its leadership of Mars exploration, but instead work with its international partners in an unprecedented joint scientific undertaking to unlock the secrets of Mars' past. Finding a way to work with ESA in a joint sample return mission would again demonstrate the pragmatic benefits of international statecraft and space exploration. InSight's success reminds us that audacity in exploration will be rewarded by the public. Taking risks for great rewards excites new generations of scientists and thinkers. Mars sample return represents the most ambitious, audacious effort yet undertaken to secure pristine samples of another world, return them to Earth, and look for life. We don't have to imagine what the future can bring: we can pursue it now. It's time for Mars sample return. 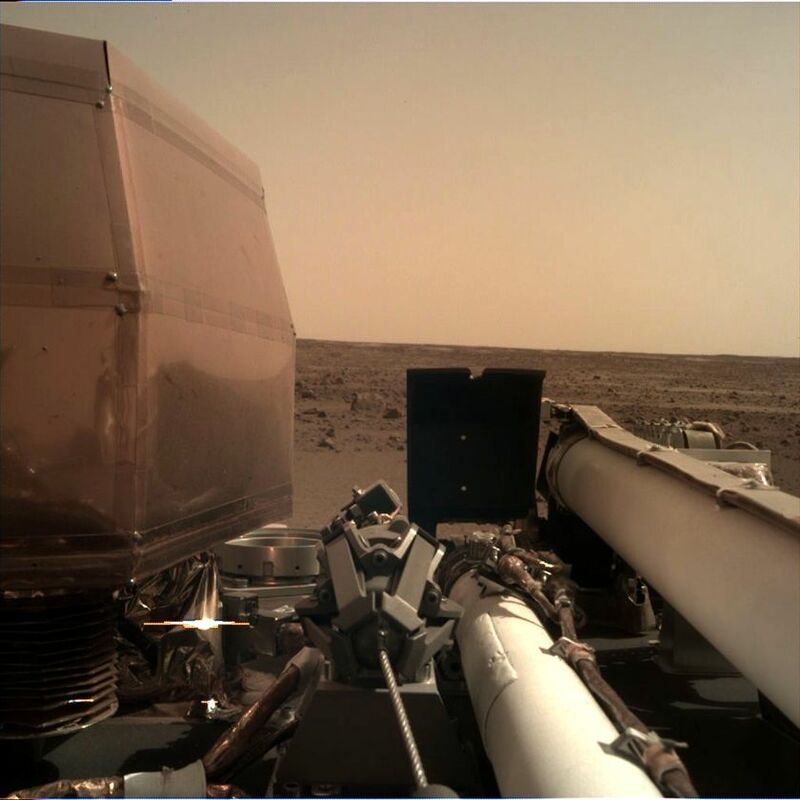 InSight took this photo shortly after landing, at 14:04:35 local solar time. The camera is mounted on the robotic arm; the upper limb of the arm is at right, and lower limb just right of center. The arm's scoop is just right of center, and its grapple is just below center. The shiny box a left is the SEIS instrument, awaiting placement on the surface. A lossless PNG version is available here. NASA and ESA should team up to do a sample return from Mars together, and to do it quick ! :) In an earlier blog, China is also keen to attempt this feat in late 2020s. 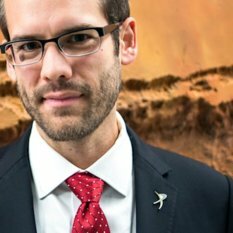 http://www.planetary.org/blogs/guest-blogs/2017/20171219-china-mars-sample-return-plans.html We now need leadership and vision to push and challenge ourselves: "We choose to go to Mars! We choose to go to Mars in this next decade and do the other things (landing and drilling into Europa), not because they are easy, but because they are hard; because that goal will serve to organize and measure the best of our energies and skills, because that challenge is one that we are willing to accept, one we are unwilling to postpone, and one we intend to win, and the others, too because we are humans!" So what's the best counterargument against the claim that we should wait until Mars 2020 actually succeeds, making it to Mars and caching samples, before we start spending money on sample return? The best I can think of is that Mars 2020 is so likely to succeed that there's no point in waiting three years. I'm not sure that's persuasive. I'd split the baby myself, and favor a budget process that might start prior to 2021, but doesn't spend the big bucks until caches have been secured. I know you can also just suspend the program, but that's also really expensive, as was the case with Insight being delayed two years. I would rather forget about Mars and get better photos of the moons of Uranus and Neptune. There's much more unknown to learn there rather than on Mars. Hi Everyone, Does anyone know what has happened to InSight No new images, no updates, etc since Sol 1. It is Sol 5 now.